Alison will read at 3:30PM in the ASU Art Museum’s 3rd floor gallery. Prior to her reading, at 2:30PM there will be a participatory reading of species inhabiting the Grand Canyon. Join us for both! Alison Deming is the author of Science and Other Poems (LSU Press, 1994), winner of the Walt Whitman Award of the Academy of American Poets; The Monarchs: A Poem Sequence (LSU, 1997),Genius Loci (Penguin Poets, 2005), and Rope (Penguin Poets, 2009); and four nonfiction books, Temporary Homelands (Mercury House, 1994; Picador USA, 1996), The Edges of the Civilized World (Picador USA, 1998), finalist for the PEN Center West Award, and Writing the Sacred Into the Real (Milkweed, Credo Series). 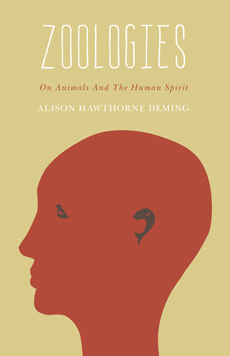 The new nonfiction book Zoologies: On Animals and the Human Spirit is out from Milkweed Editions. Deming received an MFA from Vermont College, a Wallace Stegner Fellowship from Stanford University, two poetry fellowships from the National Endowment for the Arts, and fellowships from the Fine Arts Work Center in Provincetown, the Arizona Commission on the Arts, the Tucson/Pima Arts Council, and a National Writer’s Voice Residency Award. Her writing has been widely published and anthologized, including in Ecotone, The Georgia Review, Orion, OnEarth, Isotope, Southwestern American Literature, Western Humanities Review, American Poetry Review, Verse and Universe: Poems on Science and Mathematics, The Norton Book of Nature Writing, and Best American Science and Nature Writing. Former Director of the University of Arizona Poetry Center (1990-2002), she currently is Agnese Nelms Haury Professor of Environment and Social Justice in the Creative Writing Program at the University of Arizona. She lives in Tucson, Arizona and Grand Manan, New Brunswick, Canada.